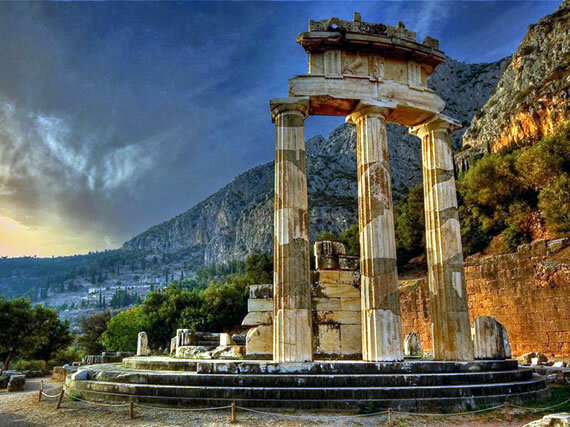 The Sanctuary of Delphi, with the most famous oracle of ancient Greece, is located at the foot of Mount Parnassus surrounded by towering crags, the Phaidrades Rocks. According to tradition, it was at Delphi, that the two eagles - sent by Zeus from the ends of the earth in order to determine its center – were met. 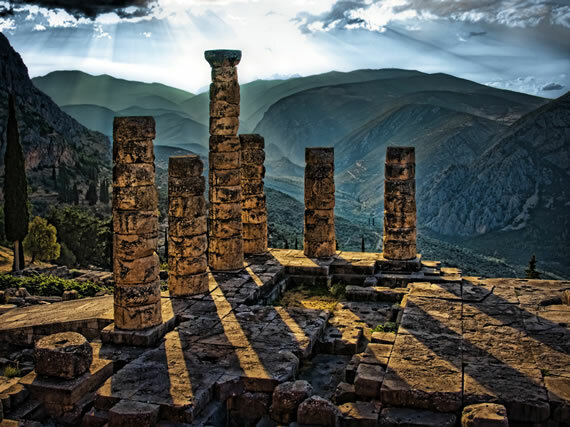 The temple is the most important building in the sanctuary of Apollo at Delphi, due to its central position. There, the statues & other offerings to the god were kept & cult rituals including that of divination took place. Also, at the temple was the chresmographeion, or archive, which was destroyed in 373 B.C. The initial stone temple was destroyed by fire in 548 B.C. Then, a new Doric style temple was built but again was destroyed by earthquake in 373 B.C. The built of the existing temple, which ruins are seen today, was completed at 330 B.C. It was of Doric style & was raised by architects Spintharos, Xenodoros & Agathon. The temple had six columns at the end & fifteen at the side & both prodomos & opisthodomos in antis. The cella was divided into three naves by two colonnades of eight Ionic columns each. The Treasury of the Athenians was one of the most important buildings of the Apollo temenos. Standing on the Sacred Way, this small building was a kind of treasury where trophies from important Athenian victories & other valuable objects were kept. The treasury, which was built by the Athenians in the late sixth or early fifth centuries B.C., is a small Doric style building in Parian marble & its shape is like a temple. Inside the treasury there are inscriptions with important honorary decrees from the third century B.C. 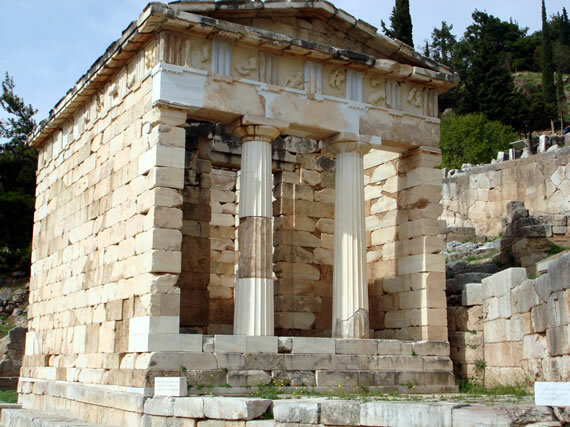 The tholos of the sanctuary of Athens Pronaia is the most characteristic monument. Located besides the later temple of Athens, this circular construction of unknown purpose is an excellent example of Classical architecture. The tholos was built in 380 B.C. by the architect Theodoros from Phokaia. The whole building rests on a three-stepped podium & twenty Doric style columns of the outer peristyle supported a Doric frieze of triglyphs & metopes with relief decoration. 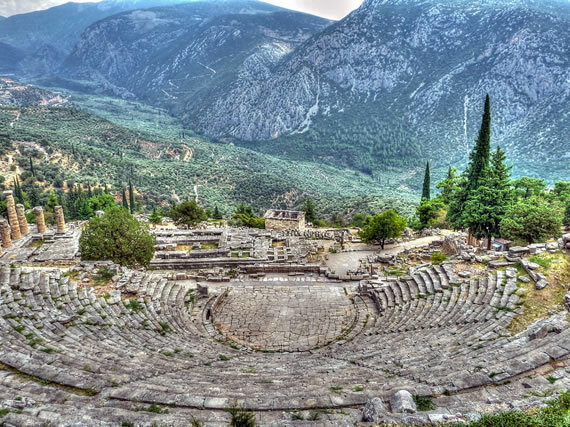 The ancient theatre of Delphi is inside the temenos of Apollo. In ancient times it hosted musical contests conducted under Pythian games & other religious festivals & rituals. The initial stone theatre was built in the fourth century B.C. The present form of the theatre, with its stone-paved orchestra, stone seats & stage, is the result of a restoration took place at 159 B.C. under the sponsorship of Efmenes B’ of Pergamos. 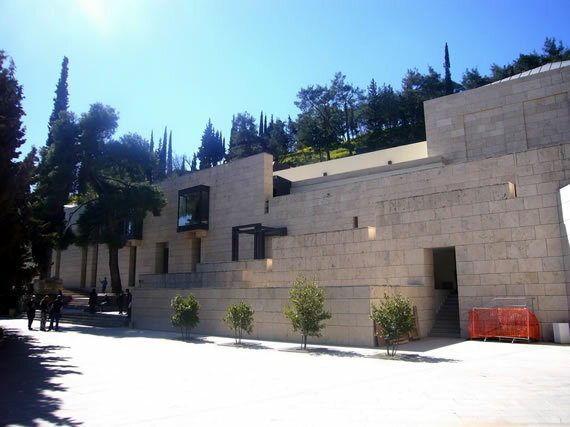 The museum consists of two floors where are exposed many important sculptures from the Archaic, Classical & Hellenistic periods. Amongst others the visitor will admire the Ophalos, the Sphinx of Naxians, the statue of Aghias, the two Kouroi (statues named Kleobis and Biton), the Silvel Bull, the Hymns to Apollo & the Charioteer of Delphi.